Department of Skill Development & Technical Education. 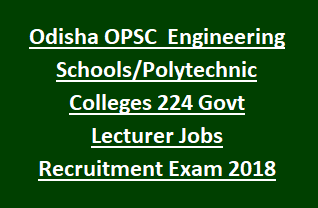 Candidates who are qualified MSc/B.Tech/B.E in first class they can apply for Odisha OPSC Lecturer Jobs in Govt Polytechnic Colleges through the using the web site of Odisha PSC @ Department of Skill Development & Technical Education. Interested candidates can apply for OPSC Lecturer Jobs using the official recruitment website of Odisha PSC @ http://opsconline.gov.in on or before 19/February/2018. Total no of Lecturer vacancies in OPSC Recruitment of Govt Polytechnics are 224 posts. 45 Posts are reserved for female candidate for this OPSC Polytechnic Lecturer Recruitment 2018. These Lecturer vacancy is filled on the basis Written exam marks and Interview. Candidate should send the online submission copy of application form to OPSC on or before 28-02-2018. For more information regarding Odisha Public Service Commission Engineering Schools/Polytechnic Colleges OPSC Lecturer recruitment 2018 Notification Qualifications, Age limits, available vacancies subject wise, Exam Pattern, Selection process, exam syllabus, exam fee see the below given details. Click here to see the official notice of Odisha OPSC Lecturer Jobs Recruitment 2018. Pay Scale for Diploma Colleges OPSC Lecturer Jobs is Rs.9300/- to Rs.34800/- plus Grade Pay Rs.4600/- and other allowances as per Odisha Government. For English, Maths, Chemistry, Physics lecturers candidates must have qualified Masters Degree with first class marks. For Polytechnic Subjects candidates must have qualified First Class Degree in B.E or B.Tech or M.Tech or ME. As on 01-08-2018 age limits are 21-32 years. For reserved candidates age limits are applicable. Candidates Selection for OPSC Polytechnic College Lecturer Jobs will be through written exam and interview. Written exam will be conducted for 500 marks. Written exam consist of General Knowledge, General English and Concerned Subject. Written exam will be held in three different papers. Exam duration is 2 hours. Total 100 questions will be given and each question carries one mark. Concern subject exam will consist of two papers. Exam duration for each paper is 3 hours. Candidates must apply online for this OPSC Polytechnic Lecturer Recruitment 2018. Eligible and necessary qualifications having aspirants can submit their application form online through OPSC website @ http://opsconline.gov.in online for OPSC Polytechnic Lecturer Jobs Recruitment 2018. After submission of application form online, take a printout and attach the required documents and send the application form copy to OPSC to be reachable on or before 28-02-2018. Candidates may download exam syllabus subject wise which is given in official notification. Apply online for Odisha Engineering Schools/Polytechnic Colleges Lecturer Jobs Recruitment 2018.